Detailing the physical features, habits, territorial reach and other identifying qualities of the Iron Cross Blister Beetle. 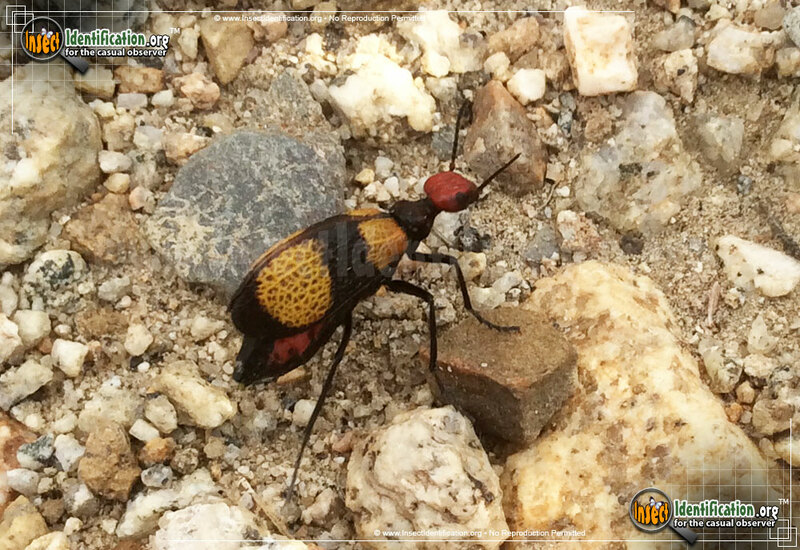 Native to the Sonoran desert, the Iron Cross Blister Beetle is dangerous to touch and poisonous to eat, making it hazardous to people, pets and livestock. Having body colors akin to a wasp, the bright yellow network of veins covering black elytra act as warning colors. WIth a bright, red head, the Iron Cross Blister Beetle gives off a bonafide visual alarm. A toxic chemical called cantharidin is secreted from the legs and antennae of an Iron Cross Beetle when handled or touched, which causes painful blisters on human skin as well as on animals. If eaten in enough quantities, it can kill. While most people would refrain from eating beetles, this insect is sometimes unwittingly consumed by horses and livestock feeding on the plants where the beetle is eating, causing death. Pets may also try to eat them. This same chemical has been used medicinally to kill and remove warts, so in a clinical sense, it is helpful to people, too. A black cross is visible on the wings thanks to a separation of the yellow color on the wings at the midline as well as at the center of the elytra. This species eats native wildflowers and herbs as well as the leaves of crop plants like alfalfa, potatoes, beans, and clover. This agricultural diet increases the likelihood of a human encounter in the field. Adults are active in the day, and sometimes at night, and it is usually seen meandering on the ground or feeding on a plant, many times with others. If seen, avoid contact with the Iron Cross Beetle and keep a wary eye for others that may be nearby.